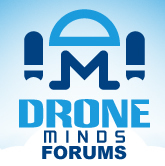 Discussion in 'Drone Minds Blogs' started by Jonathan, Apr 4, 2019. The Tello is DJI's cheapest drone at ~ $100 and is aimed at young people who are interested in drones, or older people, teachers and such, who are introducing young people to the drone technology world. The Iron Man Edition of this little toy drone is $129 and looks pretty damn cool. See the somewhat cheesy video on the link below for a detailed view of this new version of Tello by Ryze Tech, DJI and Intel that aims to teach young boys and girls about drones and basic programming skills. Though it is more in the toy market end of things, it does have some big hitters under the hood with Intel providing the chips for DJI's flight controller and the Movidius Myriad 2 VPU (vision processing unit) for hand gesture control and palm top landing. The Iron Man drone weighs only 80 grams, less than a Gopro, flies for 13 minutes on one battery and has a 5 megapixel camera.